Thanks to the review of Shae Davidson (God bless this man!) there’s a new fast narration (and wonderful) narration game available for you. 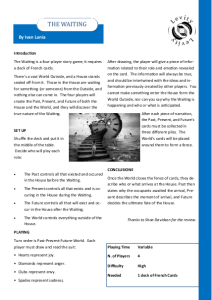 The Waiting is a four-player story game; it requires a deck of French cards. There’s a vast World Outside, and a House stands sealed off from it. Those in the House are waiting for something (or someone) from the Outside, and nothing else can come in. 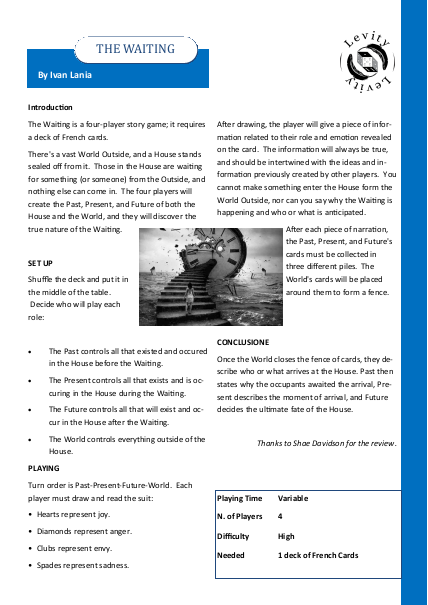 The four players will create the Past, Present, and Future of both the House and the World, and they will discover the true nature of the Waiting.